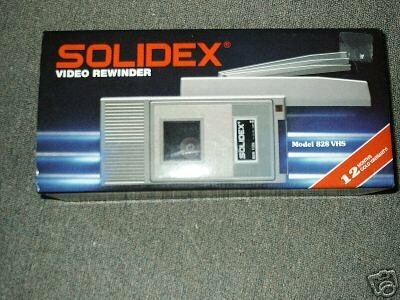 SOLIDEX VIDEO REWINDER , MODEL 828 VHS , AUTOMATIC SOFT EJECT , LED POWER DISPLAY , AUTOMATIC POWER SHUT DOWN , DURABLE ABS MATERIAL . SAVE WEAR AND TEAR ON YOUR VCR . If you have any questions about this product by Solidex, contact us by completing and submitting the form below. If you are looking for a specif part number, please include it with your message.